In this recording, the operas get a treatment somewhere between Disney and 101 Strings. Tempi are strange, and the orchestrations sometimes completely at odds with the mood of the underlying material, as if the arranger simply wanted to get all his instruments in wherever he could. The original version, WST-14133, has Mikado, Gondoliers, Yeomen, on one side, Pinafore, Patience, and Pirates on the other. The Westminster Gold reissue lacks Pinafore, which was by far the worst of a bad set of interpretations. The performance is credited to "Eric Johnson and His Orchestra." It is believed that this was actually Kurt List (1913–1970) and whatever third- or fourth- string Viennese orchestra could be rented along with the hall where the recordings were made. List was the longtime producer for Westminster Records and also conducted a few classical works for the label. Most of the "Eric Johnson" repertoire is soupy, pop-oriented arrangements of classical themes, but his recordings of Eric Coates' works are authentic and competitive. In the 1970's the Westminster classical catalogue was reissued on LP (along with some titles from Command Records) on the "Westminster Gold" label, with the goofiest cover art ever produced in the classical field. These are on view at www.westminstergold.com. There are several truly great recordings in the series, by such conductors as Artur Rodzinski, Herrmann Scherchen, Sir Adrian Boult, William Steinberg and Pierre Dervaux. The best of these found their way onto CD on MCA Classics, and later with much improved sound quality on Deutsche Grammophon. This CD is an Eric Coates /Arthur Sullivan compilation. I shan't go into the Coates details, except to say that the Coates section is 45 minutes, whereas the Sullivan section is only 30 minutes. The Sullivan items are "Orchestral Music" from Gondoliers, Pirates, and Mikado. However, despite a brief (and unusual) synopsis of each, I can tell you that the second item is not Pirates at all, but is in fact Pinafore. A note in the acknowledgements section says that the recordings were previously released on Westminster. When I got home, I checked the web site and discovered the source recording. It is not rated particularly highly, but I don't have this Westminster record, so good or bad I was pleased to at least have three items from it. End of story — or so I thought, until I played the CD. I immediately recognised the tracks. I had these recordings, but where? I searched through my LPs for some time looking for an Eric Johnson/Westminster record that I might have forgotten about to no avail. This was perplexing. There was no doubt in my mind that I knew these recordings well. Then, I thought could it be that I have this record disguised under a different label or even conductor. The answer to this is yes. After trying a few instrumental records, I found that the SAGA LP The Best Loved Melodies of G & S by the London Light Opera Orchestra, conducted by Malcolm Hughes, was in fact the LP that I knew these recordings to be from. This record must be the same as the Westminster record. But why the disguise? Is it a "stolen", illegally issued record from SAGA? Well, I think I have the answer. I think this is also very likely the story behind all the other cheap 60s LP that come from the National Musicale recordings or the Green German Mikado. Something else that is of interest about the Johnson LP/CD and the SAGA issue is the timings. I don't know the length of the Johnson tracks, I assume they are the same as the SAGA tracks because Don mentions that only 3-5 songs are featured in each medley, but the CD track timings are 9' 40'' for Gondoliers, 8' 39'' for Pinafore (Pirates !!) and 13' 01'' for Mikado — much, much longer than the SAGA tracks. After Chris pointed this out, I went home and checked my own records. The SAGA LP states, "First Published in 1965". Either this is a deliberate lie, or the publishers did not know they had been provided recycled material. The dust jacket of the 1974 re-issue has nothing but a title and a large photograph of a gaudy pair of lorgnettes. When I opened the shrink wrap, the disc inside was a recording of the first and second symphonies of Carl Maria von Weber. I've sinced obtained one of the earlier issues (right record this time), which has a crayon drawing of a ship on the front. The date is uncertain, but the dust jacket has text explaining what stereo is all about, which suggests the late '50s. 1960s? Westminster Stereo LP SS-701 Described as "Satellite Series"
199-? 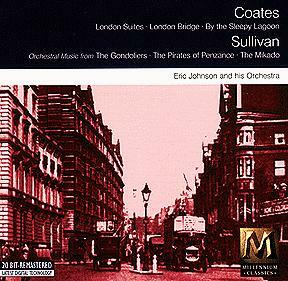 Universal/Millennium Classics CD UMD 80395 Music of Eric Coates and Arthur Sullivan. See the discussion above.